aqua computer is one of the specialists among the manufacturers of high-quality water cooling systems and offers a wide range of own development and at the same time modifies the products of other manufacturers in order to perfectly match them with the requirements in the Waku segment. High quality with German manufacturing, elegant design and high degree of innovation are essential requirements. With this article aqua computer offers a 100 cm long RGB LED strip with 60 LEDs, which is compatible with the inking RGB LED controller of aqua computer. The strip can be split every 5 cm (equivalent to three LEDs) and is encapsulated in transparent flexible plastic, which classifies IP65 according to the European standard of protection for electronic component housings and also looks very smart. The LED strip is completely dustproof and mostly waterproof protected. However, the cut edges are not waterproof and must be sealed with silicone if necessary. 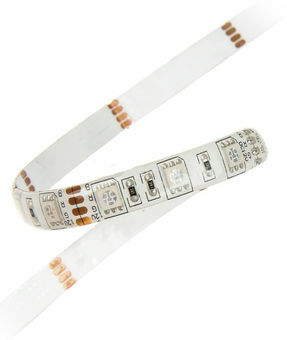 Note: The RGB LED strip is designed for cutting and must be connected via the optional connection cable MOLS-062 (black) orMOLS-063 (white) by aqua computer to be connected to the inking unit.